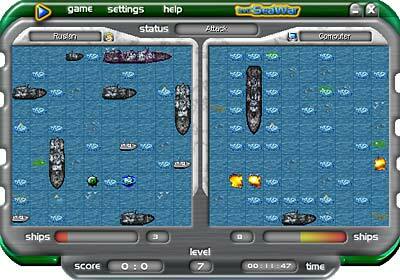 SeaWar is Battleship clone game. You can play against both a computer and a human over a local network or the Internet. You can talk to an opponent during the game by means of embedded chat. The game has nice and intuitive interface with skins support, which you can download from the game site. Various types of game and 7 levels of complexity give you extraordinary game experience. The ESC key quickly hides the program to the tray area. ...... Various types of game and 7 levels of complexity give you extraordinary game experience. You can easily play the game at your workplace. The ESC key quickly hides the program to the tray area. * Skins and sound collections support. Qweas is providing links to SeaWar 3.0 as a courtesy, and makes no representations regarding SeaWar or any other applications or any information related thereto. Any questions, complaints or claims regarding this application SeaWar 3.0 must be directed to the appropriate software vendor. You may click the publisher link of SeaWar on the top of this page to get more details about the vendor.